Children from socially deprived areas — 1,641 elementary students in all — were specifically targeted by a government-funded study that promoted a large drink vendor. The experimental intervention, which had no scientific basis and is known to put children at risk for harm, involved compulsory lessons of mythologies designed to scare these youngsters...thin. Medical ethics is, indeed, a fragile thing. How did this study pass an Institutional Review Board? There are ethical guidelines on human experimentation which especially safeguards the welfare of under-age children and other vulnerable populations who are not in positions to give voluntary, informed consent. Yet, no medical professional has spoken up on behalf of these underprivileged children. Mainstream media has heralded the program, inaccurately reporting that the intervention is harmless and could be the answer to childhood obesity and help kids fight fat, and even that it had proven effective and able to “prevent obesity in kids.” In actuality, it had failed and wasn’t harmless, either. Why has no health writer reported what was actually happening to these young disadvantaged children? It would have taken just minutes to go beyond the abstract and read the actual study, to look up the registered clinical trial protocol and Google the curriculum to learn what was being done to these children. It would have taken just one health reporter who understood science… for the world to have learned the truth. Yet, no journalist did.. This week’s online issue of Pediatrics, the journal of the American Academy of Pediatrics, published the report of this study. It was led by Rebecca Muckelbauer in the department of dietary behavior at the Research Institute of Child Nutrition Dortmund in Germany. They identified 32 elementary schools in socially deprived areas — as defined by disproportionate numbers of parents who were “non-German” born, unemployed or on government welfare — and randomly selected 17 of those schools to test a program of promoting water and use of water bottles for preventing overweight in children. The explanation given for why minority and poor children were selected was that they were most likely to have poor diets that put them at risk for obesity. This comes from two unscientific premises. The belief that parents of poor children feed their children less nutritionally than those of high socioeconomic status, as numerous international studies have found, is not supported by the evidence. Nor does any sound evidence support dietary or behavioral interventions in children for the prevention of obesity, because fat and thin children eat no differently to explain the diversity of their sizes. “Pure water does not contain energy and thus may support a healthy weight status if it replaces sugar containing beverages,” the authors said. Water could fill children up so that they eat less in meals or promote weight loss through thermogenesis, they said. 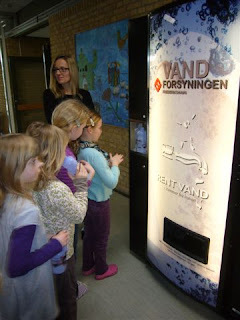 In each school, a vending machine that delivered cold, filtered water was installed and each child was given a plastic water bottle. Teachers were instructed to organize the children to fill their water bottles each morning. The height and weight of the children in the intervention school and control schools were measured and their BMIs SD scores were determined. [As we’ve covered before, since children are growing, researchers use the z score (also called SD score) which accounts for a child’s age and gender and compares their BMI with average children of the same age and gender.] The children also self-reported the beverages (water, juice and soda) they drank, and the water consumption from the vending machines was monitored with flow meters. At the end of the school year, the 1,641 children who completed the program were compared with 1,309 children in control schools. The authors concluded “the estimated group difference in BMI SD score changes (-0.004) was not significant.” While the authors failed to report any actual weights or heights, clearly this program was unable to demonstrate a significant effect on the children’s size or any long-term effect. The study also failed to recruit enough children to be sufficiently powered to statistically detect even a 4% difference in weight status between the intervention and control group. Nor did the study prove to have any effect on reducing the consumption of caloric beverages measured. The estimated increase in water consumption was 1.1 glass a day among the intervention students, but there was no statistically significant difference in juice or soft drink consumption. Whether water displaced nutrient-rich milk was not even examined in this study, which is significant when you learn what the children were taught. In fact, missing from this clinical trial was an examination of any potential harms resulting from the intervention. The study design didn’t include any examinations of the children’s nutritional status, disordered eating or unhealthful weight concerns and weight control behaviors — adverse effects which have been shown to increase in other studies of childhood anti-obesity dietary interventions. About three-quarters of the school classes organized the entire class to fill their drinking bottles from the vending machine each day. But about half of the teachers (51%) reported that the water bottles were disruptive of classroom education, with 15% of the teachers prohibiting them in class. 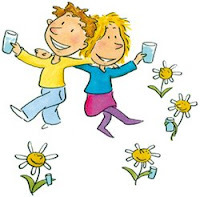 Our environmental and educational, school-based intervention, with the single focus on the promotion and provision of drinking water, proved to be effective in the prevention of childhood overweight. It was effective even with a population from socially deprived areas, which encourages introduction in the general population. The full study as published in Pediatrics already reveals the discrepancy from the actual findings and the favorable portrayal to the public. But this is only part of the story. To understand what the children were actually being subjected to requires going to the registered study. This study was registered at clinicaltrials.gov (NCT00554294) and called Trinkfit. This program is probably unfamiliar to most American readers, but is the “Trinkfit—mach mit!” anti-obesity initiative being directed to school children in both Denmark and Germany. 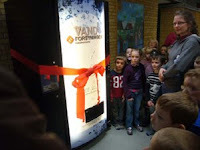 It promotes a new vending machine cooler, invented and patented by Juul & Partners, which made the vending machines and water bottles for this program and this study. “This new Vending machine will be the 21st century’s answer to the old water fountains in the cities,” states the company’s marketing. How many of the poor parents knew what their children would be taught in the Trinkfit—mach mit! curriculum and freely gave their informed consent? The intense lessons and complex health concepts being given to their children would frighten and be misconstrued by most adults, let alone young children. How many parents would want their children exposed to these lessons, reinforced every school day, to have their children herded down the hall to fill bottles every class and be instructed to record the water they drink? "Wer regelmäßig trinkt, hat mehr Kraft und Vitalität." Regular consumption of fresh water is stressed in the Trinkfit curriculum as critical for the body to function, keep from overheating, facilitate the removal of metabolic end products in the urine, transport nutrients in the blood, and work with enzyme-dependent metabolic processes. “Water is the most important nutrient for the human body,” children are taught. They are told that their body is about two-thirds water and that they need to drink much more water than adults. Youngsters age 7-10 years old are instructed that they should drink at least one liter of fresh water a day and teens 1.5 liters. It they are active and play sports or are outside in the heat, they should drink three to four times that. Water, mineral water and teas are the best drink even at meals and even for young children, the program says. Drinking water regularly enough has to be learned, says the curriculum. Most children don’t drink enough water and are dehydrated, it claims, because thirst is not a sufficiently strong signal to let them know when they need to drink. “By the time children perceive thirst, it’s too late,” the children are told. Drinking too little water sets the entire body off: the blood is thickened and makes the heart work harder. Losing just 5% of water can be life threatening. Children are told that it’s not only severe, acute water shortages that can threaten their health, but that even slight dehydration of 1-2% causes them to lose 20% of their physical and mental capacities and result in health problems like urinary tract infections, constipation, asthma and heart stress. At a loss of just 2.2%, short-term memory and concentration is impaired. Children who don’t drink enough water, they’re taught, don’t concentrate well, learn poorly and been shown to have lower academic performance. Under the guise of preventing childhood obesity and “healthy” diets, beliefs are overriding science and ethics in increasingly disturbing ways. Using health scares to compel little kids to guzzle water isn’t science. We don’t know what affect this program had on the health and well-being of these underprivileged children, or their worries about their body, health and diet. This study wasn’t designed to find out. It was designed to create a fear of thirst and hunger… and teach young poor children that both could be deadly. The origin of this legendary scare are reports detecting lead in school drinking water, such as Seattle and New York. But, school drinking fountains are not exposing children to dangerous levels of lead and the miniscule amounts detected in the water have not been shown to put children at risk. Our modeling suggests drinking water exposures up to 10–15 times the Environmental Protection Agency guideline are unlikely to result in [blood lead levels] exceeding the current guidelines of the Centers for Disease Control and Prevention in the absence of other significant exposure sources. In Seattle, elevated school drinking water lead concentrations are not a significant source of lead exposure in school-age children. ** Eating disorder specialists know this behavior well: water for weight control is not only unsound, it’s an eating disorder behavior.